The delightful Villa Bali at Jeda Villas is a 3-bedroom, contemporary Balinese styled holiday home featuring open-air living, a large swimming pool, huge gardens and stunning views of the nearby ocean. 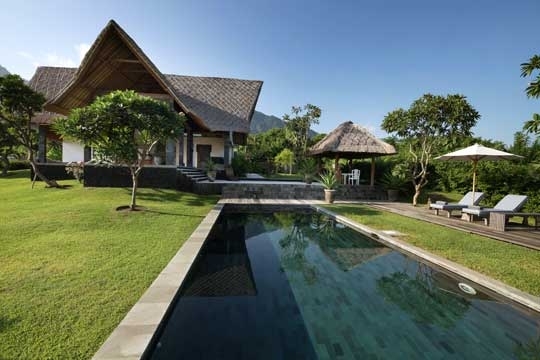 The fully-staffed property is one of an enclave of three villas at Pemuteran in ruggedly beautiful north-west Bali. Northwest Bali is severely under-represented when it comes to private holiday villas... at least it was, until now. One of three villas that make up the Jeda Villa estate, Villa Bali offers guests with good taste and a penchant for northern Bali, the chance to do a whole lot of absolutely nothing – or maybe a little bit of sightseeing, hiking or diving – from a quality comfortable base, with gorgeous views of the ocean. 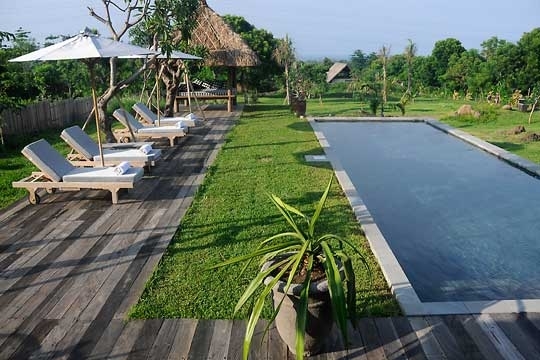 The three-bedroom, two-storey Villa Bali overlooks rolling lawns and blue sea to the front, and is bordered behind by the mountainous beauty of the West Bali National Park. 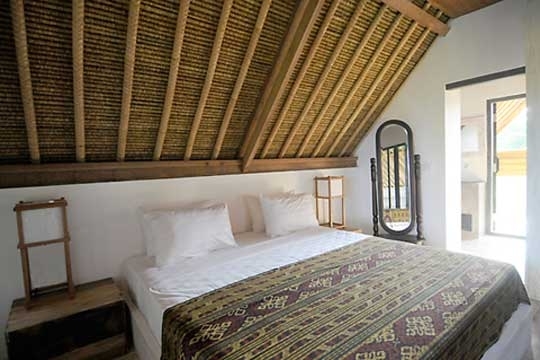 This eco-friendly, contemporary-Balinese-styled house consists of a large open-sided pavilion with a soaring alang-alang thatched roof complemented by a cool selection of local stone and chic furnishings. It presents a choice of semi-indoor and alfresco living and dining areas, an abundance of space, a 12.5-metre swimming pool, and a huge garden dotted with trees and volcanic boulders. 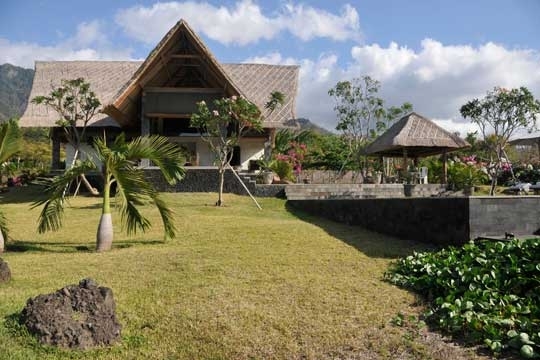 Villa Bali can be rented on its own or in conjunction with one or both of the other two Jeda Villas – two-bedroomed Villa Timor and three-bedroomed Villa Java – which collectively offer options ranging from two to eight bedrooms, making an ideal choice for groups of friends or families with older children. The location may be a bit remote but with the villa’s complementary shuttle service into and around Pemuteran, you will have the opportunity to check out the local restaurants (all within 2km) and dive centres. On the other hand, with a competent cook shared between the three villas (breakfast is included, other meals are on guest account), a caring team of staff, and a masseur on call, you will be very well looked after at “home”. Not many visitors make it as far as this rugged north-west corner of Bali but those who are bold enough to venture away from the crowded southern plains will discover another world. 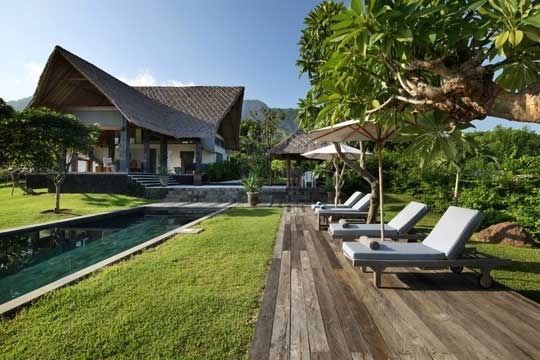 If you encounter Villa Bali on your travels, it is quite possible that you will never want to leave. It’s so quiet here; apart from the other two Jeda Villas there’s not another house in sight – something that will make you feel very special indeed. Taking in a cocktailed sunset from the vantage point at the back of the garden is a real treat. Not good for small kids who like to run around a lot. They could slip on the tiles and take some interesting spills or falls from the open staircase up to the mezzanine. It’s a long way (145km) from the airport but that’s part of the villa’s appeal. Entering Villa Bali via a bougainvillea-draped pathway, the first space that guests will encounter is a standalone, dining pavilion beside the pool, sheltered by a thatched roof and furnished with a table for six. The 12.5m swimming pool is bordered by a timber deck on two sides. Here, four umbrella-shaded sunbeds and a thatched balé relaxation pavilion with a deeply cushioned mattress and cushions covered in the traditional black and white chequered cloth known as poleng await. The pool extends through rolling lawns punctuated with a flourishing collection of trees. Aspected towards the sea view, the symmetrical two-storey villa is characterised by polished concrete tiles and dark grey lava stone pillars supporting a soaring thatched roof. In addition to the alfresco dining space, the open-sided building presents a downstairs dining table for eight, and a sunken lounge area where a built-in L-shaped sofa overlooks the garden. On the opposite side, a huge daybed rests within an alcove. On the ground level are two air-conditioned bedrooms, each featuring wooden shutters, glassless windows, rustic furnishings, a carved wall panel, and a built-in queen-size bed. 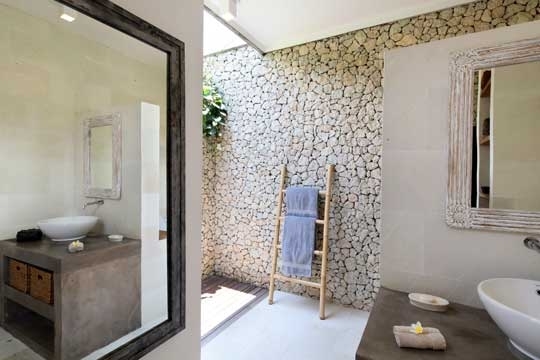 In the ensuite open-air bathrooms, white flowering thunbergia creeps over the top of the coralline random rock walls; each has a single washbasin and monsoon shower where a pivoted shutter swings open to a hidden corner of garden. Also positioned downstairs is a guest washroom, and a small kitchen suitable for self-catering and fitted with four burner hob, microwave oven, oven-toaster, and fridge. 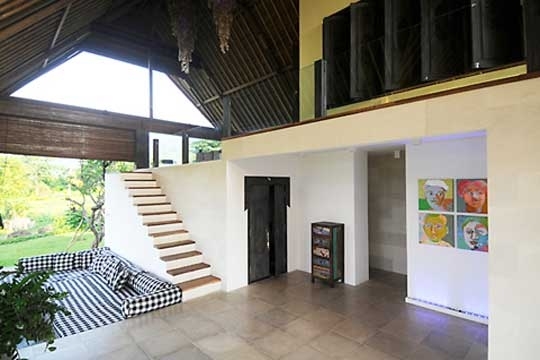 An open-sided staircase leads to the breezy mezzanine level with living space on one side furnished with a daybed and a zebra rug and equipped with an iPod dock and a small screen for watching DVDs. From here, two steps lead up to an air-conditioned attic bedroom with queen-size bed. Shutters open to the distant sea view at the front, and the small ensuite bathroom is fitted with a washbasin and monsoon shower. Doors open to a balcony, which wraps around to join the mezzanine area and overlooks the side garden and the untamed bushland. 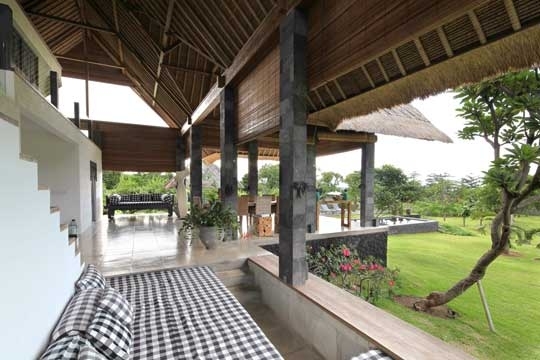 3 bedroom villa located in Pemuteran, Bali. Ideal for Beach in ten, Body and soul, Eco aware, Fair share for groups, The great outdoors, Romantic retreats, Sensible for seniors, Room with a view.